Are you looking for a professional? This is an overview of internationally acclaimed professionals in their field. The choice of facilitators and content of their presentation has a strong focus on self-empowerment, freedom of choice, art and music, wealth creation, personal development, business strategies, financial success, heritage, cultural aspects, environmental issues, outdoor recreation, health concerns, alternative technologies and spirituality. World class transformative speakers, entertainers, performers, educators and presenters add value and audience participation to your event. Providing informative and engaging content in their live shows, offering guidance, entertainment and solutions on a wide range of topics. Should you require an artist or presenter for a specific topic not featured here, please contact us for assistance, as we do have access to a large network of public speakers and performers. Enhance your event with a suitable entertainer or educator. Draw attention and crowds to your event and engage your audience. A true Aussie bushman, Celebrity Chef Ranger Nick is a genius when it comes to mouthwatering bush cooking. When he is not passing on his knowledge of the great outdoors, he is cooking up a storm and creating delicious hearty meals with simple ingredients and no fuss cooking methods. Considered a dinky-di Aussie character who walks his talk with no dull moments, Ranger Nick’s colloquial language and unique sense of humour have earned him the reputation of the entertaining Bush Cook. Keeping heritage and traditions alive, he combines educational information with bush poetry, yarns and ballads during his camp oven cooking demonstrations. Appealing to young and old, he leaves a lasting impression wherever he goes and is a conversational point long after the show has finished. Drawing crowds at his performances around the country, Ranger Nick is walking his talk and practicing what he preaches, showing how to eat like royalty, whilst roughing it in style around the camp fire. 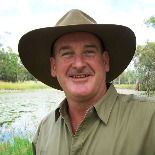 Ranger Nick has weekly segments on River 94.9FM, guest appearances on Merv’s Outdoors, is the author of two books, has released a DVD and represents the typical down to earth Aussie country bloke. Ranger Nick is a big fan of keeping it simple and travels all over the country, teaching how to whip up some tasty treats. He is putting his skills to use to show you the true Aussie art of producing a cracker of a meal with whatever is in the tucker box. David Dahwurr Hudson is an internationally renowned musician, artist, entertainer, presenter, actor, co-producer, consultant, educator, mentor and bush craftsman. A highly accomplished performer, David has toured the world with Yanni (Greek composer) for many years. He has performed at the Taj Mahal and the Forbidden City, acted alongside Marlon Brando and Val Kilmer in The Island of Doctor Moreau and has won a TV Logie Award for Presenter for My Place, My Land, My People. He comes from the Ewamian (oo-rah-min)/Western Yalanji (people of the north east coast of Australia) and his life reflects his love and belief in Aboriginal culture. David Hudson is the co-founder, choreographer of Tjapukai Aboriginal Cultural Park and was the Creative Director and then General Manager in recent years. He is well known around the world for his music and has released over 27 albums which range in their medium from the traditional right through to the classical arena. Raised in New Mexico/ Arizona, Reuben's mother was a Cherokee medicine woman and his father was a Nedhni Apache spiritual wise man. Growing up in a unique spiritual and musical world has influenced and moulded the love, respect, spirituality and music that Reuben Silverbird practices today. He has appeared on stage, film and TV in the USA, Europe, Australia and Asia. He is regularly invited by leading universities and performs ceremonial blessings at the Nobel Prize Institute in Norway. Reuben travels to the Four Corners of Mother Earth with The Universal Peace Federation. He is attached to the United Nations as an NGO, (Non-Governmental Organization); he is only one of the countless men and women Ambassadors who speak on behalf of "Love and Peace throughout the world today." Reuben is joining spiritual leaders from all over the world, bringing his captivating stories, wisdom and music to millions. He combines native American wisdom and traditions with modern day living, showing how to encourage world peace and sustainable living by honouring ourselves, each other and mother earth. Reuben appeals to young and old, regardless of cultural background or religious beliefs, addressing fundamental values of spirituality with a vision to have a world of all peoples united. Dave “Mossy” Moss is a nationally known fishing presenter and enthusiast. Having fished since he was 6 years old and with a pro-fisherman for a father, fishing is undoubtedly in Mossy’s blood. With his vast knowledge and enthusiasm for fishing, Mossy delivers a highly entertaining and exciting show with that will be sure to engage both kids and adults alike. He will educate his audience showing the catch and release technique with live Barramundi in his 10m Shimano Tank. A big draw card are his audience participation and massive prize giveaways during the show. Kerwin Rae is a Businessman, coach, mentor, author and International speaker. He has studied and observed the psychology of influence for well over 10 years and is considered an expert of human behavior and how it relates to sales, marketing and personal transformation. He has addressed and worked with all levels of business from corporate entities to national and international franchise groups through to the small to medium size business owners. He has also worked with high school, university students and the general public. He is the author of "The Entrepreneurial Apprentice training system and co author of one the best selling series "Secrets of Marketing Experts Exposed". Kerwin has been a regular on Talk Back Radio in Australia and is teaching through workshops and seminars nationally and internationally. Born in California, Cherokee medicine man Bobby Runningfox is an intuitive healer with an amazing accuracy, and has helped people all over the world on a physical, emotional and psychological level. On his Native American journey, Bobby was guided by his grandmother and uncle, both powerful medicine people, who greatly influenced his life path. Connected to spirit, Bobby teaches people to live in the moment, heal the past and not to worry about the future, how to bring harmony to themselves and others around them. His journey now is to awaken those beings that want to see. Heal those who really want to learn to heal themselves. Love those who allow themselves to be loved. People come from far and wide to attend his enlightening workshops, taking home some of the incredible knowledge Bobby Runningfox has to share.